Fall is in the air and Boozie just loves it! Football season is here and so is the smack talking that comes with it! I find all of the jabs on social media almost as exciting as the games. And, too, there is just something about a little chill in the air (even if it’s only for a day or two), that makes folks a bit randy, which is good for me and this biz. So grab a pumpkin-spiced something, roll around in a pile of leaves and start a fire in your fireplace using this newspaper — well, as soon as you’re done reading the scoop the spies and I have been gathering the last week. The point is to get your fall on. Enjoy! (Photo/ Boozie Spy) Can you fix stupid? Removing this from your car would be a start. 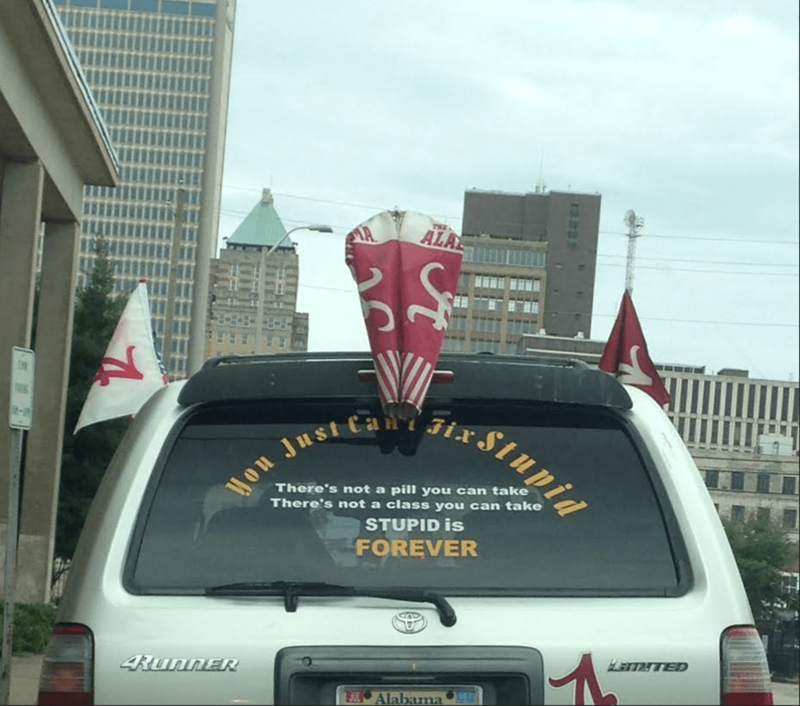 Last week a car was spotted downtown with not just a bumper sticker about people being stupid, but a decal that took up almost the entire back window. The decal read as follows: “You just can’t fix STUPID. There’s not a pill you can take. There’s not a class you can take. STUPID is FOREVER.” Boozie is dying to know what “stupid” person drove this individual to do such to his or her car. 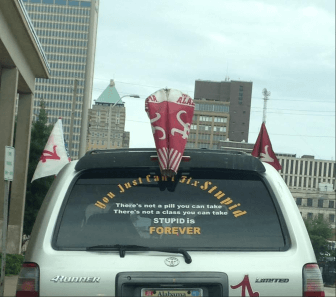 The car was also decked out in the University of Alabama flags and Alabama “A” magnets. Maybe it was Uncle Henry. Roll Tide Roll! Last Saturday night, folks headed downtown to the Saenger Theatre to see the Black Jacket Symphony perform The Allman Brothers Band’s “Eat A Peach,” as well as a full set of their greatest hits. Though the show wasn’t sold out, there was a great turnout. 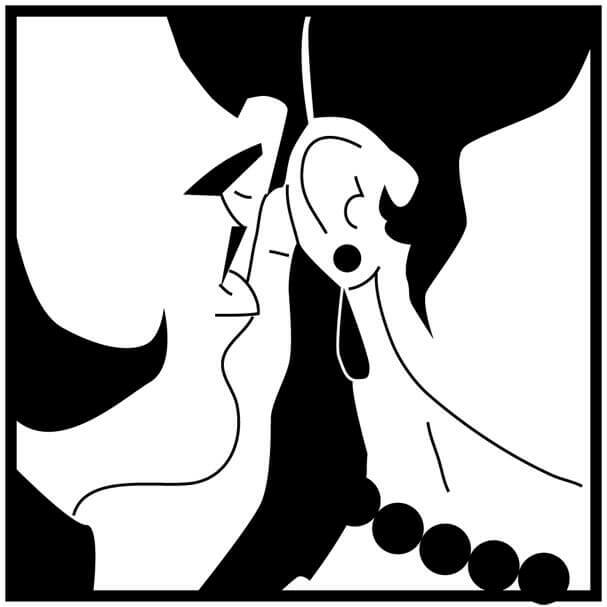 One spy said it was an amazing show and a really good time. My other spy confirmed its amazingness and goodness and said he can’t wait for the Symphony’s next show in which they will play Journey songs. Now, this show hasn’t officially appeared on the Saenger’s website just yet, but do as I am do and “Don’t Stop Believin’”! No movie star sightings to report this week, but Mobile was buzzing with important people in town for Airbus’ opening of its Mobile plant Monday morning at Brookley Field. Ambassadors from Germany, France and the United Kingdom were in attendance as well some ‘Bama folks like Gov. Robert Bentley, former Gov. Bob Riley, Sen. Jeff Sessions, Rep. Bradley Byrne, Mayor Sandy Stimpson and former Mayor Sam Jones. Most of the City Council was there as well. In case you haven’t heard, Airbus is a big deal, or as Vice President Joe Biden would say, a big “f-ing” deal! Mobile is the first manufacturing location for the company on U.S. soil and only its second location outside of Europe. A big step for sweet little ol’ Mobile. Maybe not, that’s just plane silly. I will be waiting if anyone calls on the fly for a record deal. 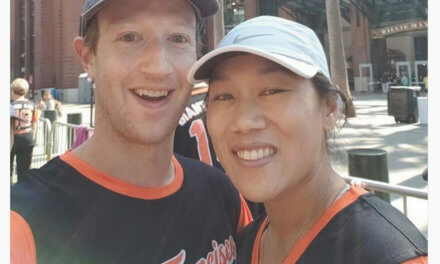 Ok, I will stop now. Well, kids, that’s all I’ve got this week. Just remember, whether rain or shine, dramatic or scandalous, or just some plain ol’ Airbus lovin’, I will be there. Ciao!